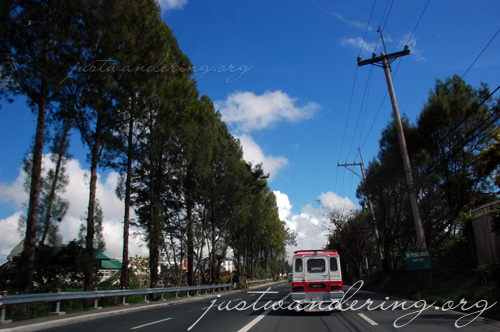 Tagaytay’s location makes it the perfect weekend destination, whether for a short weekend getaway or just a daytrip. Just 1.5 hours from Makati, its perch on the Tagaytay ridge means the city enjoys mild temperature throughout the year. The gorgeous views of the Taal Lake and Taal Volcano makes for an unbeatable combination of greens and blues. We left the house past 4:30am, picking up Hazel along the way. It was still dark, and it felt odd to be driving out at this hour, since we would usually be driving home at this hour. Surprisingly, there was a number of vehicles already on the road. Most are trucks rushing to their destinations before the truck ban starts at 6:00am. We have grossly underestimated the time the sun rises, as the sky was getting lighter and lighter the further we drive south. Though the country has woken up by the time we exited in Sta. Rosa, traffic was still light all the way up to Tagaytay. 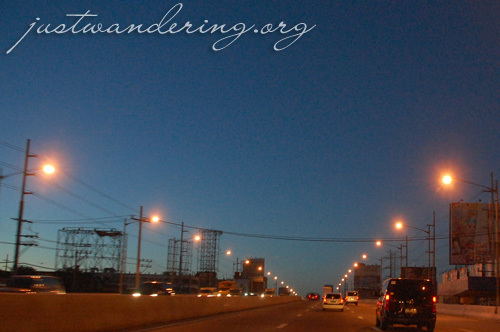 The only problem area we encountered was that stretch from Bicutan to Sucat, where the four-lane South Luzon Expressway merges down to just two (or three) due to the Skyway construction. As soon as you reach the Alabang flyover though, the roads clear up. Travel time from Eastwood in Quezon City to Tagaytay that morning took only 1.5 hours (Quezon City is about 30 minutes away from Makati on a very good day). RELATED: How much of the Philippines have you visited? The road from Sta. Rosa leads up to the Tagaytay Main Road, where you can turn left to head to the Picnic Grove, People’s Park in the Sky or down to Talisay. 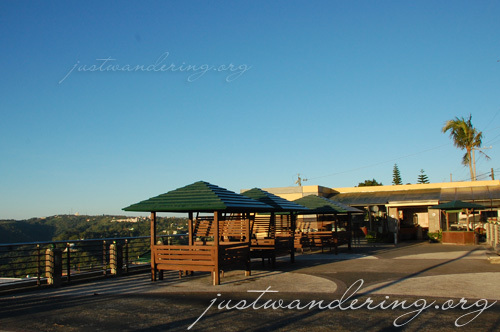 Turning right brings you to the many guesthouses and restaurants in Tagaytay. Right across the road though, is the Tagaytay Econo Inn, where there’s a view deck with a couple of cabanas that overlooks Taal. Since it was just 6:30am, we were able to park at the restaurant next door. Pictures shot and taken, the next item in the agenda was to find breakfast. Since it was a Monday, not a lot of establishments open as early as they do on the weekends (when the tourist flock). That’s how we ended up at two places you can easily find in Metro Manila: Pancake House and Starbucks. Food at Pancake House is definitely better than any microwaved foodstuff in the coffee shop next door, but Starbucks’ open-air second floor has one of the best views of Taal volcano and lake. What I love best about this Starbucks branch is that there’s no stuffy airconditioning, just fresh mountain air. The wind can be pretty fierce sometimes though, so it can be freezing up there. Back to last Monday. We pried ourselves off Starbuck’s comfy couch to drive back to Manila. We waited for 10am before heading back down to avoid the rush hour traffic. There are more vehicles on the road now, but traffic is still relatively light. Of course, we slow down as soon as we pass Alabang due to the Skyway construction, but as soon as we pass Bicutan, the road opens up again and we were soon back in C-5, heading back to Quezon City. We made it with just enough time for Hazel to clock in for her 1:00pm shift. Except she didn’t go to work. This wasn’t the first time we went up to Tagaytay on a whim. Earlier this year, Rey had a similar impulse to have coffee in Tagaytay in the middle of the night. We left QC just past 9:00pm, and was up in Tagaytay at nearly midnight. We stayed until the coffee house closed, driving down the dark roads from Tagaytay to Sta. Rosa at 2 in the morning. Prior to that, it was me and Hazel who went up to Tagaytay. Her brother was spending the weekend there with friends and casually remarked in one of his texts to his sister that we should join them there. We had nothing to do that weekend, so what the heck? We went home to get some clothes and met up at the MRT Taft station, where I previously saw buses headed to Tagaytay and Nasugbu (only to find out later on that there are similar buses departing from Cubao — where Hazel and I originally hanging out. Doh). Tagaytay really is a welcome respite from the city. It’s close enough to drive to whenever we feel like it, and the view and the fresh air can do wonders for your state of mind. I figure these spur of the moment things are bound to happen more often than not. Well, I’m hoping for more often. We just need to find a better breakfast place. Kay: It’s so nice that just 2 hours from the city you get a place that is a stark contrast no? 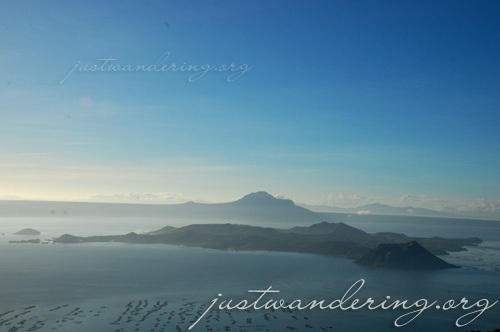 I would like to travel to Taal Volcano and Taal Lake. This picture is beautiful. That’s what I often do – jump in my pick-up and drive to nowhere in particular, for no reason in general than to be somewhere else other than where I am at the moment. I hope to see Taal Volcano someday. I love the last paragraph of this post! Thank you for your posts, an excellenct source of information and reaLLy super big heLp.